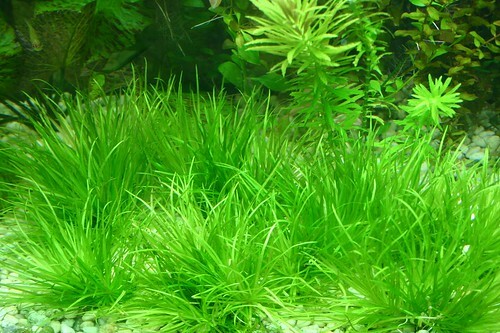 This Blyxa species is not too hard to grow. For proper growth it is recommended to use intense lighting (+2wpg). moderate co2 injection (2-3bps), fertilisation regimen (inc nitrates, phosphates, potassium, micro-nutrients and iron), Iron sticks/tablets are also recommended. With these requirements met, this beautiful bushy plant will stay low & bushy, colour of the growths (golden pink - deep purple). But if one of these elements are missing, leaves will turn green and will grow taller and thinner. This plants produces a large root system and appreciates a high nutritious substrate. If phosphate levels are kept high at 1-2ppm, this lovely plant will produce lots of small white flowers on a long and thin stalk. Once established, this plants produces many side branches which can be easily removed and replanted atleast 10cm apart. These can be very buoyant and tend to float, but these will take root very easily. This Blyxa japonica above has been talked about around the world for many years now, and was achieved by myself :) I was able to plant the blyxa onto of my java fern about 10cm below water surface, it grew towards the lighting (150watt Metal Halide and 2 x 24w T4s, between the blyxa and the lighting, it was only 10cm distant) and with the addition of 4 times the recommended dosage of iron and running 5 bps, I was able to turn my green Blyxa japonica to deep purple. 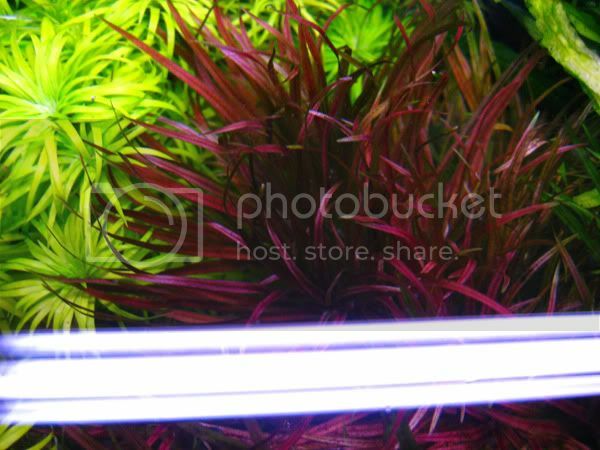 All plants in the tank grew wild, with Cherry shrimps and fish all healthy.